The Cook Pine is a tall evergreen conifer that can grow up to 50 – 70m in height although locally heights of 25 – 30m are more common. The branches are set at right angles and occur in whorls around the trunk. The gradually decrease in size up the tree giving the Cook Pine its characteristic narrow conical shape. Flowers being a conifer, this tree does not actually produce flowers but instead produces cones, which are borne at the tip of the branches. Male and female cones are carried on separate plants. The male cones produce pollen, and are long and cylindrical, 5 – 10cm long by 1.5 – 2.0cm wide. The female cones are broader and large, 10 – 15cm long by 7 – 11cm wide. The fruits\ consists of a large broad woody oval-shaped cone, which is formed form the fertilized female cone, and it contains nut-like seeds that are about 3 cm long. However, both male and female cones are seldom formed under local conditions. Although it grows quite straight in its native homeland, the trunk sometimes has curious tendency to curve or lean quite dramatically when gown here in Singapore. The bark is greyish-brown in colour, and is quite rough and papery, is straw-coloured with a knottey pine character. Cook Pine is fast growing and drought resistant, and exhibits some salt tolerance. In Singapore, it appears to be relatively free of pests and diseases. However, its small fine leaves are prone to being covered by soot, therefore it tends not to grow well near industrial areas or along roadsides where pollution levels are high. 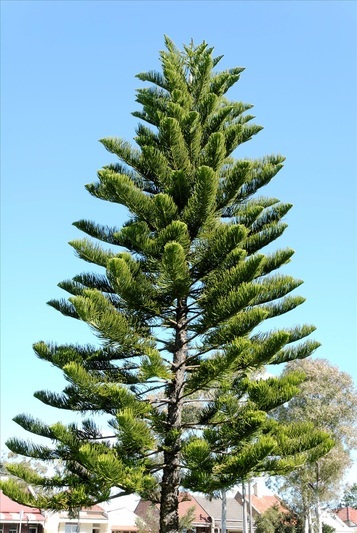 With its attractive tall narrow columnar crown, the Cook pine is striking when planted next to tall building. It can also be planted in park or large garden either singly or in groups for use as an ornamental feature tree. Young Cook Pine trees can be decorated and used as Christmas trees in tropical countries such as ours where traditional Christmas trees do not grow. Cook Pines are suitable for reforestation and are commonly planted for timber. The wood is quite decorative with interesting knots and is use for making furniture and bowls.